Yep, it's happening. 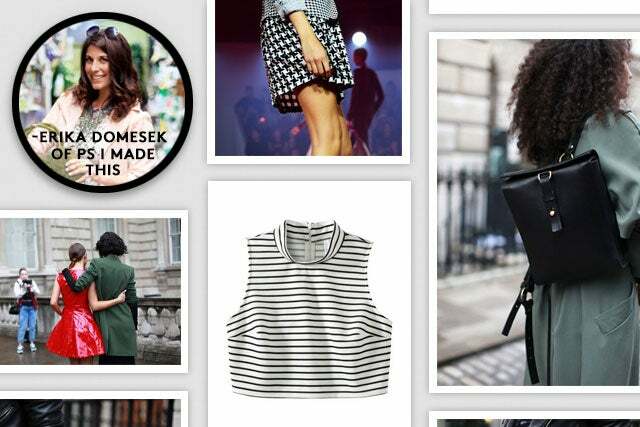 Street style, Pinterest, shopping — all together, at once. See, we know you love scoping out looks on the sidewalk. We suspect you love Pinterest (at least, that's what the experts at the Refinery29 Department of Statistics say). And we know, for an absolute fact, that you love to shop. So, we're teaming up with one of the best bloggers out there to put all of these obsessions into one delicious style sandwich, our Street Shopper Pinterest board. Here's how it'll work: Our editors and Erica Domesek of the beautiful, addictive P.S. I Made This... will scan the World Wide Web for the best street-style images out there (including our own amazing photography) and pinning them to our shared Street Shopper board. Then, like the crafty little style minxes we are, we'll pin down the chic products and pieces that you can pick up at Target. That way you can replicate the sharp ensembles at fairly attractive prices. It's a little like buying your wardrobe straight off the shoulders of the world's best street-style stars — but, you know, without the awkwardness. Visit P.S. I Made This... on Pinterest and follow Street Shopper to get in on all the fun. Enjoy!